1. Have you ever participated in the online football gambling before? 2. Do you agree with the above-mentioned opinion on the football gambling and why?3. DIY one topic as you like, but do stick to the theme. It reminds me of my college life as I had little interest in the World Cup until I became a sophomore. With time goes by, that sort of crazy and enthusiasm no longer belongs to me. 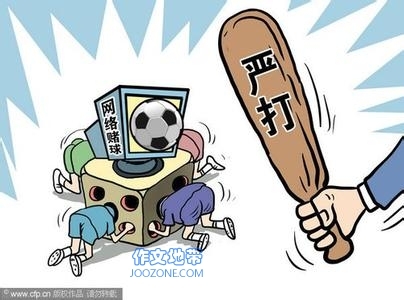 In spite of this, each time when the World Cup is held, I will get infected by those passionate fans around me and can't help watching the football games. When it comes to the football gambling, I think it will arouse our enthusiasm for football to some extent, but the amount of money should be controlled within limits. I have never participated in such a money gambling, but if the stake is HuYuan, I'll be more willing to take a guess. After all, don't be too serious about the win or lose, and just enjoy the pleasure the World Cup brings to us. I have never participated in any form of cyber-gambling, but indeed I know the excitement and the thrill. The world cup is a fat chance for the gambling agencies to load a great deal money in their pocket and a big entertainment for the football fans. Butyou can be no supporters of any team, at the same time you experience the same palpitating effects when put a stake in these games. When you gamblingon a team, potentially you become a fan of this team, the outcome of match will decide the direction of your cash flow. When the team wins and you win money,how great is that! And when the team you bet on it goes the unexpected way,what a sad story because your money will say bye-bye to you. All in all, online betting is no big deal, and perhaps it can enhance and be a catalyst for you to enjoy a football match. However, never put all your money on that, there's abig difference between having fun and committing suicide.